A regular sight in the pre-draft prospect market, 2016 Leaf Metal Draft Football continues the chromium-centered release for another year with the newest batch of NFL talent and a surprise appearance from Tom Brady. Increasing the yield from 2015, each hobby box includes five on-card autographs. 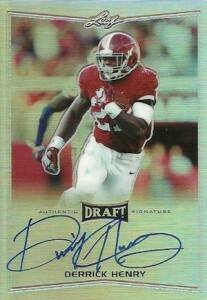 Only featuring hard-signed cards, the all-autograph product offers a handful of designs and is geared more to the key offensive positions and players from the top universities. 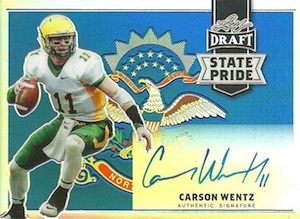 In addition to the main Metal Autographs, collectors can also find Armed and Dangerous Autographs, which focus on top QBs, State Pride Autographs, which showcase the player's state flag in the design, and Touchdown Kings Autographs that highlight the biggest scoring threats. Each option can also be found with multiple numbered Prismatic parallels as limited as one-of-one. Although 2016 NFL prospects are the primary component of the release, including Ohio State's Ezekiel Elliott, surefire Hall of Fame quarterback Tom Brady is also in the mix, giving the product added appeal for NFL collectors. Redemptions are noted below (R). Not all subjects included in each parallels. View the full spreadsheet for specific print runs. The cards look great, there’s a pretty good chance at a big hit. Pulled a Derrick Henry Black Ref. Autograph /15, as well as a Paxton Lynch “Armed & Dangerous” Pink Ref. Auto /15 in the same box. It’s hit or miss for sure, but from my experience, it’s more hit than miss… It’s worth risking $90 on.